Functional recovery after nervous system injury or disease. Dr. Muir's teaching responsibilities in the professional veterinary undergraduate curriculum are for VBMS 222 Veterinary Neuroscience. This course is an overview of the structure and function of the nervous system, with an emphasis on the localization of nervous system lesions in domestic animals. 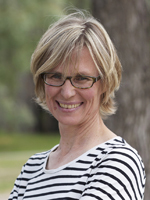 She is also involved in teaching graduate courses on Biomechanics, Pain, and Behavioural Neuroscience. Dr. Muir's research focuses on the changes in sensorimotor behaviour which occur after central nervous system injury or disease. Work in her lab is currently examining the use of a novel non-invasive treatment to improve functional recovery after spinal cord injury. Hassan A, Arnold BM, Caine S, Toosi BM, Verge VMK, Muir GD. 2018. Acute intermittent hypoxia and rehabilitative training following cervical spinal injury alters neuronal hypoxia- and plasticity-associated protein expression. PLoS One. 13(5), doi: 10.1371/journal.pone.0197486. Lovett-Barr M*, Satriotomo I*, Muir GD*, Wilkerson J, Hoffman H, Vinit S, Mitchell G 2012. Repetitive intermittent hypoxia induces respiratory and somatic motor recovery following chronic cervical spinal injury. Journal of Neuroscience, 32:3591-3600. Bennett SW, Lanovaz J, Muir GD. 2012. The biomechanics of locomotor compensation after peripheral nerve lesion in the rat. Behavioural Brain Research, 229: 391-400. Muir, G.D. and Prosser-Loose, E.J. 2011. Chapter 21: Assessing Spinal Cord Injury in Neuromethods: Animal Models of Movement Disorders, Emma Lane, Stephen Dunnett (eds). Humana Press, New York.